Now your 5- to 10-year-olds can enjoy Hurnard's devotional classic! Your kids will travel with Much Afraid and the Chief Shepherd to the High Places, where "perfect love casts out fear." End-of-chapter quiet-time thoughts, Scripture readings, and prayers teach your kids how to follow the Good Shepherd. - Publisher This illustrated version of the timeless classic has been arranged by Dian Layton and beautifully illustrated by JoAnn Edington. It tells the story of Much-Afraid and her journey to the High Places with the Shepherd. Filled with exciting adventure and a triumphant conclusion, this story will teach young children the importance of following the Shepherd. About "Hinds' Feet on High Places"
This illustrated version of the timeless classic has been arranged by Dian Layton and beautifully illustrated by JoAnn Edington. It tells the story of Much-Afraid and her journey to the High Places with the Shepherd. Filled with exciting adventure and a triumphant conclusion, this story will teach young children the importance of following the Shepherd. 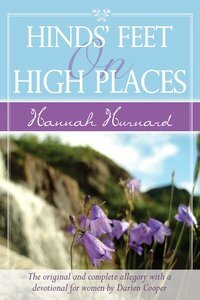 Hannah Hurnard is best known for her allegory Hinds' Feet on High Places and Mountain of Spices, she was a missionary in Haifa, Israel for over fifty years. In her later writing she moved away from Orthodox Christianity to universalism and pantheism.